An ambitious and beautiful RPG that falls just short of greatness, thwarted by a stunted finale and imbalances. 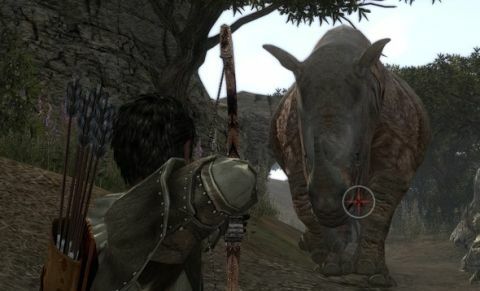 Of all the open-world roleplaying games of the past decade, Two Worlds was likely the worst. Its titular globes represented an unpolished, badly translated Gothic-clone orbiting an interminable, lifeless Oblivion-clone. Yet this sequel almost completely redeems the series. Its combat is innovative, character choices are meaningful, it's gorgeous to explore and it's largely bug-free. Until it peters to a linear, inglorious finale, Two Worlds 2 offers remarkably satisfying open-world adventuring. In two words: much better. The original game was little more than an open-world sandbox with a skeletal plot to serve as a navigational aid. NPCs had little to say, and even that dialog was barely coherent. TW2 fleshes out its world with a more substantive storyline and characters who, while still not loquacious, are personable and articulate. The plot remains simple—your haplessly bound and uncomfortably attractive sister needs rescue—but the improved story and colorful NPCs, including some unlikely orc allies, make exploring this world purposeful and rewarding. The open-ended skill system eschews classes and gives you an abundance of tactical options to consider. I decided that I was going to be a death-dealing spelunker to solve a chain of labyrinth quests, so I equipped an axe and a torch (a necessity in TW2's pitch-black dungeons). After acquiring the Fire Strike skill, a portion of the physical damage I inflicted became fire damage, thanks to the equipped torch. Once I gained Shield Pull, I could disarm enemies with my axe. After realizing that undead were more vulnerable to blunt trauma, I nabbed a skill book to unlock a mace-specific feat that stuns opponents. Many undead bones can attest to the usefulness of non-combat skills—whenever I overloaded, I dismantled extra loot into components which I used to substantially improve my equipped gear. Magic is similarly customizable, and allows you freedom to alter spell effects at any time by substituting collectible modifiers. Only the stealth system feels underdeveloped, although instantly assassinating surprised opponents is hugely satisfying. TW2 still has plenty of room to grow, though. You can't fight on horseback, for instance. Many skills are unbalanced—some are of dubious utility while others, such as Alchemy, feel half-baked. The single-player story gets increasingly linear for little payoff; we still get a sizable map out of the deal, but later areas aren't as fleshed-out since the plot isn't compelling enough to justify limiting open-world exploration. Multi­player is improved, but is disappointingly mission-based instead of allowing co-op wandering. Yet it is such a huge improvement over its dismal predecessor that it's oh-so-close to being an outstanding RPG. Its design just needs some rationalization and focus to achieve something great.